I will never buy that kind of "sudo-programmable" keyboards after I found out what the real programmable keyboards utilizing QMK can do. Talking about programmable keyboards, I have Planck, Let's Split, and Ergodox Infinity. Yes, they are all non-staggered, all programmed with QMK (Ergodox Infinity as well). I also have KUL ES-87 which is mechanical but not programmable and which I use at work now in change with Planck. I'm planning to retire KUL 87 it in near future and switch completely to ortholinear and programmable keyboards. Not sure about Ergodox, I think I will use Let's Split or similar to it split keyboard as a main and Planck as a travel keyboard. my current typing test result seems like I am hovering in the ~50wpm range need to up it to 70-80 in the next few months. My first suggestion would be to mostly ignore raw speed and get accuracy to around 97% (with a long-term target of 98%+). This is important both for comfort and speed. When typing normally, I usually delete the whole word if I mistype (Extend+T+O or Ctrl+Back), forcing me to retype the whole word correctly. This is often more pleasant anyway, but also lets me train that word better. Improving the accuracy is turning out to be much more harder than I thought. My fingers seem to constantly type/press the keys *sighs* guess I need to control myself from prematurely pressing keys and being trigger happy about pressing keys. The guy who made Amphetype was very concerned with evenness, or "viscosity" as he called its opposite. I don't think it should be an overshadowing principle, but it has its benefits. A good typist can slow down and speed up as needs dictate, speeding through the easy stuff while maintaining accuracy in the difficult parts. My accuracy has gone up to 96% with a lot of relearning. I just figured out that for me more difficult thing are the following keys : r,s which I seem to confuse with qwerty still even though I haven't used it in 2 months now. I need more typing practice since my fingers still are typing qwerty keys every now and then when I encounter new words. At that point I think that more practice will help, yes. I still type books with Amphetype, that gives nice mileage. Yes practice is something I really need to dedicate time for every day. Which I am not currently doing(able to do) on a regular basis. I am practicing in https://www.keyhero.com/free-typing-test/ as they have a good mixture of punctuation and my accuracy takes a big hit on that along with my speed. So thought that it would be a good way to practice and improve my accuracy. 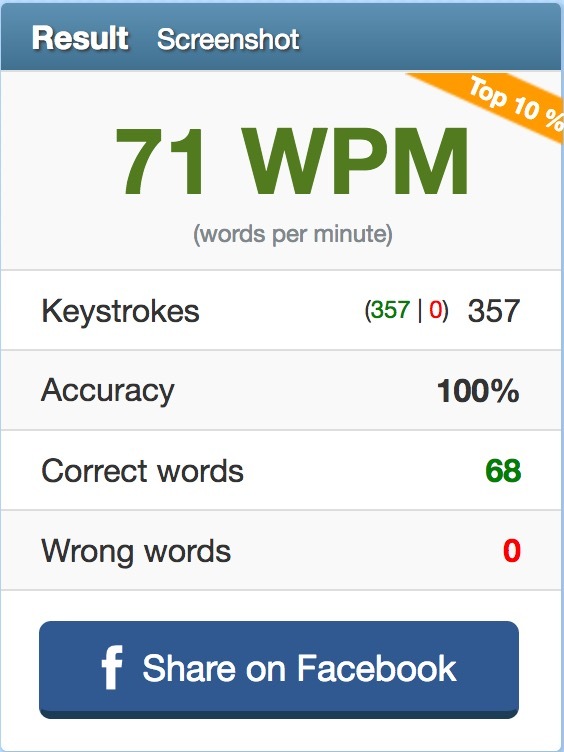 two days I was away from the keyboard and my accuracy has gone down :( any one else faced this issue? my typing is all messed up don't know why? :( it seems as though my muscle memory has forgotten about the layout. Yeah, that can happen. Don't sweat it, it doesn't mean anything serious. Thanks, that is slightly comforting to hear but I don't know why my accuracy takes a hit every day in the morning. It seems like my hands need like a warmup period, has that happened at all? by now I thought that my hands should kind of just get the keys right, I am still having issues with typing the right keys when I am typing a new word is that expected? Edit: does any one else find it hard/slow to type duckduckgo? new personal best, still my accuracy isn't that consistent. I am still not able to touch that speed consistently still trying to improve. But I agree with your earlier post, improving the accuracy is more important than speed (working on maintaining accuracy also as we speak). I am kind of plateaued at 60wpm with accuracy lingering at 95->98%. Any tips on getting better in terms of speed and accuracy? The Typing of the Dead has some fun speed and accuracy drills. See my Big Bag topic. Thanks I will take a look at that. Also, I am not able to get amphetype working on my Mac has anyone had any luck with that? 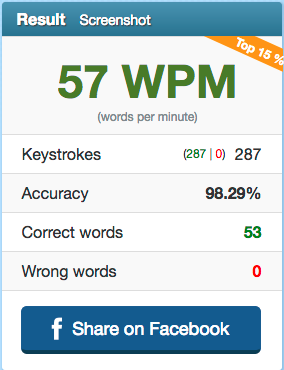 This is really weird my accuracy has gone down again and I seem to be typing the wrong keys again. Is this natural?